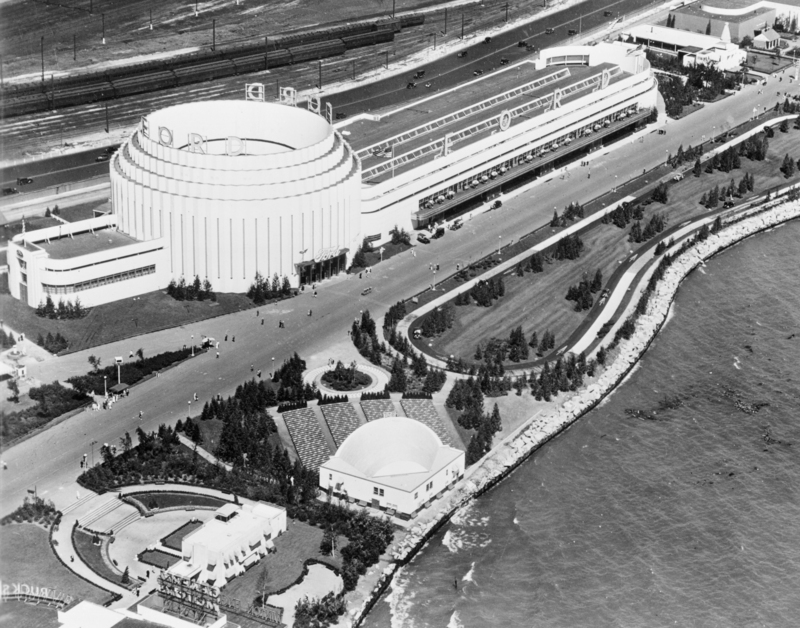 The Ford Rotunda, as it was called, was the brainchild of company founder Henry Ford and architect Albert Kahn, who designed the building specifically for the Ford Motor Co.’s contribution to the Fair. The Fair’s theme was technology, which inspired the tagline: “A Century of Progress,” and since planes, trains and automobiles were a large part of the Fair’s showcase exhibits, Ford fit right in. The 12-story Ford Rotunda had a long wing extending off the base, thousands of multi-colored exterior lights, and in the open-aired middle, a spotlight that shot skyward and could be seen for miles. Inside was the large rotunda, with moving parts and displays, including a photographic mural of a Ford plant and a 20-foot high globe. In 1934, when the Fair closed, Ford had the building dismantled and moved to Dearborn, Michigan near the site of the Rogue plant company headquarters. “The reconstructed rotunda is expected to relieve the congestion,” the papers noted, referencing the attendance numbers at the Fair. On May 4, 1936, in Dearborn, the Rotunda opened its doors again. Then in 1953, to celebrate Ford’s 50th anniversary, the Rotunda went through another transformation. A geodesic roof was constructed over the open center. This allowed for more varied and seasonal exhibits, including the appropriately titled “A Christmas Fantasy,” which combined sparkling new Ford cars with holiday-themed displays. The Christmas tree and doll displays were especially popular. 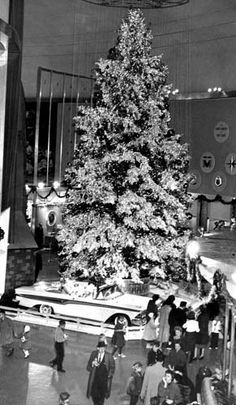 “A Christmas Fantasy” drew so many people that the Ford Rotunda became one of the most famous and frequented buildings in the nation. It quickly surpassed more established tourist attractions like the Statue of Liberty and the Washington Monument in the number of visitors attending each year. That is until November 9, 1962. On that day a kettle of hot tar used for winter sealing was left unattended and the Rotunda’s roof caught fire. Thankfully, everyone got out safely and only one worker was slightly injured. But the building didn’t stand a chance. It was gone in less than two hours. Ford decided not to rebuild. This entry was posted in History and tagged 1933 Chicago World's Fair Ford Rotunda, A Century of progress Chicago World's Fair 1933, Ford Rotunda, Ford Rotunda Christmas Fantasy, Ford Rotunda Dearborn Michigan, Ford Rotunda fire, Ford Rotunda fire November 9 1962, Ken Zurski author blog, Unrememebered History.